Nolo books are a great resource for anyone looking to educate themselves on the process of inventing. Nolo offers resources on legal topics – from an overview of how a process works, to providing the actual forms you will need to make your invention a reality. For inventors, the books provide some great resources on those topics that might require a little hand handling – from protecting your invention via a patent, to profiting from it – licensing it to a manufacture or selling it yourself. They even offer small business guides to help you get your head around everything you should think about, when starting your own business. Many inventors choose to make a business out of their product idea, and Nolo books are a great resource to start you thinking about everything setting up a small business might entail. I am a big fan of Nolo books as a resource for inventors in all stages, but especially to those just starting out. If you have an idea for a new invention, and you are not yet sure whether it has potential and what direction you might take, shelling out the big bucks on a consultant, an invention help company or an attorney might look intimidating. Nolo books are a cheap alternative (around 50$ max for books, and you can get them for much less if you choose to buy an ebook), that allows you to get all the basic information you might need, without committing to a pricy external advisor. You can then take in all the information at your own time, and decide whether you want to do things yourself, using some of the forms they offer (you usually get them for free with your book or ebook) or to opt for professional help. Even if you do end up paying an attorney or an inventions consultant, you will find yourself more prepared and have a much better understanding of the process of inventing and what it entails, so that you can ask the right questions and save on the time you hire them for. This is a great book if you want a full overview of the topic of protecting your invention via patents. From explaining what patents are, to clarifying how they can help you and what you need to do to get your product patented. 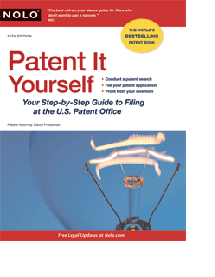 This book will not only take you through the process of patenting, but will also cover topics such as how to conduct a patent search or handle patents disputes. It also has a chapter about International patent law, giving you insight on how to patent your invention in other non US countries. It provides all the information you need to have from covering the difference between trademarks and copyrights to listing the actual fees involved in each stage of the patenting process. It does all this in a very clear and understandable language. What really makes it a great resource is the fact that it has been recently updated, in May 2012 – and so you can be sure that all the legal advice in it is up to date and takes into account any recent changes to US patent law (American invents act etc). This book is a great resource, suitable for both beginners and experienced inventors. While it does cover the basics and gives you a good overview of what patents are about and how they can help you, it takes you one step further and guides you on everything you need to do, if you want to bootstrap and patent your invention, yourself. 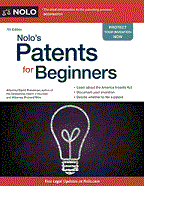 This slightly more advanced resource (compared to Nolo’s patents for beginners), goes one step further and guides you in evaluating the commercial potential of your idea and helps you prepare your own application for a patent. If you believe you will rather do things yourself, this is the book for you. It even has chapters on marketing and licensing your invention, so it’s a great investment to guide you throughout the process of inventing. A great addition to this book, which almost makes it worth the price in itself, is the tear-out forms that accompany it. From a non-disclosure agreement to guard your ideas to worksheets that will help you in the process, to a universal license agreement that will allow you to sell your invention all over the world - this book has any form you might need in the invention process. The new edition was updated on April 2011, and so it covers all recent changes to US patent law and any new court rulings. This is our most recommended guide! Read more about it on Nolo's online store.